The energy from the sun can be categorized as diffuse or direct radiation. Direct radiation is sunlight that comes directly from the sun, and diffuse radiation is the light that’s scattered throughout the atmosphere. For instance, when you’re in the shade, you aren’t subject to direct radiation, but you can still see because diffuse radiation reaches you. On a clear day, the portion of sunlight that is diffuse radiation can be as low as 10%. PV systems need to capture as much direct radiation as possible. When a solar panel faces the sun directly, it captures the most direct radiation possible, as illustrated below. The panel on the right, which directly faces the sun, catches more “sunbeams” than the one on the left . The panels are the same size and are centered at the same position. The graph shows the portion of the panels’ highest power yield for the day throughout daylight hours. As the sun rises, its direct solar radiation takes time to reach its peak. A tracking system follows this rise without loss, while a stationary system waits until noon to achieve its maximum power. The slight decline in power into the afternoon is due to heating of the system. The results vary depending on location, season, and weather, but generally they will look the same: tracking systems quickly reach a plateau of power for several hours, and stationary systems only briefly reach their maximum power around midday. There are a variety of ways to describe the type of motion and angles a solar tracker is capable of. These fall under two categories, single-axis and dual-axis. A single-axis tracker can move east two west, but its angle on the north-south plane is constant. A dual-axis tracker can orient itself in any angle. Unlike a single-axis tracker, a dual-axis tracker is capable of facing the sun directly at any time during the day. We used a dual-axis tracker for the graph above. A solar tracker consists of a mount, mechanical actuator, and controller. The mount is what holds the solar panels, and is capable of moving along one or two axes. The mechanical actuator is the motor device that moves the mount. The controller is the device that computes the position the mount should assume. There are a lot of factors that impact the performance of tracking system that should be considered. In a field of trackers, if some trackers cast a shadow on the others, then the field isn’t doing much good at all. If a storm comes on, solar panels are at risk of damage. Solar trackers should be able to should be able to stow in a safe position in these conditions. 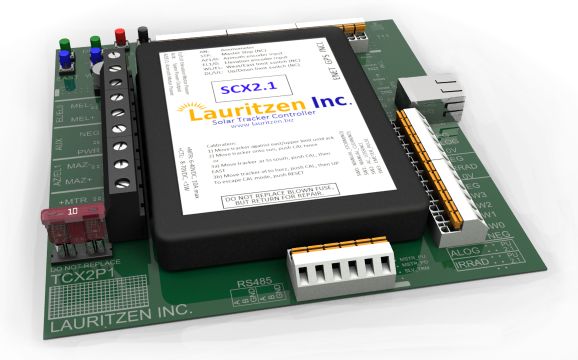 Lauritzen Inc. offers a line of solar tracker controllers that take these factors into account, and come with a wide range of features that enhance system safety and control. The most notable of these is remote management. With Lauritzen Inc.’s management software, you can control your tracking system from a computer or smartphone, either locally or through the internet. Our controllers are all based on the CX2 hardware platform, with specialized software to suit either standalone trackers or fields of many trackers. We can provide controllers specialized for your specific tracking system. Contact us, and we will determine which tracking solution is right for your situation. Nice Article! Thanks for sharing information about Solar Tracker.